If you want to get an H-1B visa, you should get your visa certified in March via Indian outsourcing companies that are located in New York City, hire programmer analysts, pay out a base salary above $75,000. Or at least, that’s what an analysis of data from h1bdata.info suggests. In the wake of president-elect Donald Trump’s election campaign, where illegal immigration was at the center, voices to abolish the H-1B visa and speculations about the extent of the H-1B visa reform are going strong, not only in the United States, but also in India. With 15 days left to the inauguration of Donald Trump as the 45th President of the United States, it’s a good time to take a look at the H-1B visas that have been certified over the last years. Other Indian outsourcing companies, such as Tech Mahindra Americas, companies that are based in other countries, such as Accenture, outsourcing firms based in the United States, such as Cognizant Tech Solutions, or other firms that are based in the United States, such as Deloitte & Touche, generally rely less on H1-B workers. This is very much in line with other sources, that suggest that outsourcing companies will be the first to undergo tougher vetting if an H-1B reform passes. These companies are clearly the so-called ‘low-hanging fruit’: they make the most out of the current H-1B policy. Nevertheless, also if any reform would be put in place, there would still be an effect on the other 6 companies that are based in the United States. 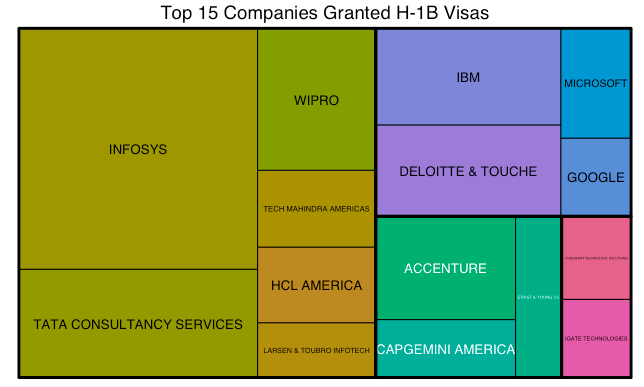 But, rather than being a matter of outsourcing versus other firms, this top 15 of companies that have certified H-1B workers indicates that the tech industry would be affected: these are the names of information technology or technology companies. Putting aside the impact on the industry, the data also shows that the more populated the state, the more job opportunities that need an H-1B visa: most applicants are located are California, New Jersey, New York and Texas. Cities that stand out in the analysis are New York, Houston, Atlanta, Chicago and San José. The job opportunities that are most certified in these states are the programmer analysts. Next in line are the software engineers, computer programmers, systems analysts and software developers with H-1B visas. It’s clear that the base salaries above \$75,000 not valid for most H-1B workers: the median is somewhat above \$60,000. Comparing these salaries to the ones that can be found on sites such as PayScale, this doesn't give an initial impression of being a cheap program. This is something to work out in further analyses. The h1bdata.info data also indicates that March stands out as a peak for getting H1B applications certified. This means that most people have applied for a visa by January. But, in general, applicants don’t have to worry about your H-1B applications getting certified: only 5,13% of all applications that our data set captured doesn’t. This percentage seems quite high, and maybe it is, considering the fact that this visa is for workers in specialty occupations (as the above has already demonstrated), and the requirements. This is definitely something that will be reconsidered, as the Protect and Grow American Jobs Act seems to demonstrate with the proposal to eliminate the Master's degree exemption. Studying the data to help your H-1B application might help, but only to a certain extent. For now, we only know this: we’re not sure how Trump and his administration are going to crack down on the H-1B visas, but the above already gives a good idea: outsourcing companies are probably the first to be tackled by a reform in the H-1B program and, on a higher level, the tech industry in more populated states are the first ones to feel the effects. Also, the requirements for the candidates will likely become stricter. Do You Want to See All This Yourself? Go ahead and analyze the data for yourself! DataCamp instructor Ted Kwartler will guide you through it with a series of R tutorials! 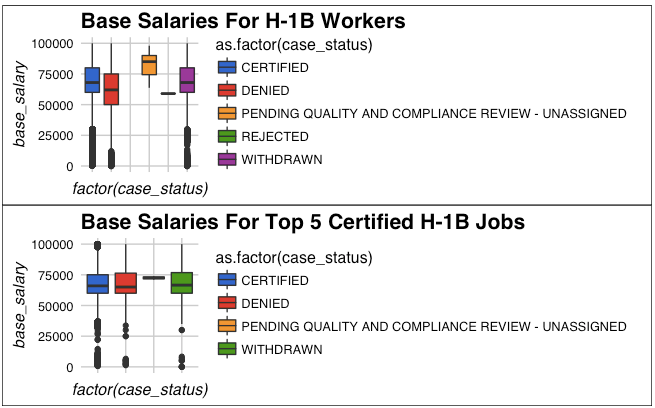 Web Scraping and Parsing Data in R | Exploring H-1b Data Pt. 1: In the first part of the tutorial series, you'll learn how you can gather data about H1B visas through web scraping with R. Get started here! Exploring H-1B Data with R: Part 2: You'll build further on the data that you gathered and you'll learn how you can add more visuals to your Exploratory Data Analysis (EDA) work and introduce some new functions. You can find the tutorial here. Exploring H-1B Data with R: Part 3: Learn how to geocode locations for latitude and longitude coordinates from an API, how to create a map of the data and learn the top H-1B software developer employers and compare their salaries by year. Go to this page to start the tutorial.